Natalie Appleton has given birth to a baby boy - and the lucky little tyke gets a suitably showbiz name. The 29-year-old singer and husband Liam Howlett have named their 6lb 13oz son simply Ace. 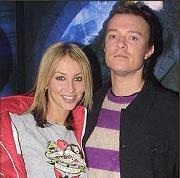 Ace is Natalie's second child but her first with Liam, 32, the Prodigy star, whom she married in France three years ago. Natalie's spokeswoman told the Daily Mirror: "Liam is thrilled at being a first-time dad. Mother and baby are both doing very well."